Coding work on Paint.NET v4.0 has been progressing steadily, with a lot of progress being made on what you could call technology upgrades. More importantly I’ve made it past some important decisions. XP support is out so that I can focus on Win7/Vista and use Direct2D, DirectWrite, and the latest WIC (Windows Imaging Component) improvements. I’m hoping to implement a ribbon, although I’m still not entirely sure how to approach MDI with it. I think the current tabs+thumbnails approach works very well, but it may conflict with the official Ribbon UI licensing requirements. The canvas area will be hardware accelerated as much as is possible, and I’m also planning to pull in a docking panels system for the tool windows. Honestly, the transparent floaty windows thing was a neat idea but is starting to show its age, and it doesn’t work well at all on netbooks (1024×600 is a common resolution), or for a non-maximized window. The result is a very cramped UI for many situations. The library I’ve chosen to handle this works very similarly to Visual Studio, and has a lot of happy users already. And lastly, here are the raw numbers. Please note that “hits” refers to update manifest text files, not web site traffic in a browser. They are the result of an installation of Paint.NET being active and checking to see what the latest version is. Paint.NET doesn’t check for updates unless it’s open (no TSR’s), and it checks every 5 days at most (longer if it hasn’t been opened in more than 5 days, of course). 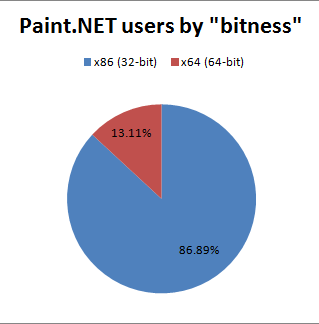 Thus, these numbers are closer to indicating usage of Paint.NET as opposed to the raw, installed base of users. The Paint.NET forum has moved! Yay! I wish you’d stop worring about superficial things like ribbons and tool windows. Nobody is unhappy with the current UI, but current functionality could certainly stand to receive some work. Re: MDI. How about putting the open files thumbnails on a separate tab in the Ribbon? Tim, thanks for saying that my work is superficial. Anyway, I will worry about whatever I want to worry about and if you don’t like that then you should not post a comment. Edit: Toned down the snarkiness of my response. I guess there’s always dissing people on the internet to keep me amused. You mention that Windows XP support is out, but you’ve shown that over 50% of your users have XP. Are you planning on supporting the 3.x code base for a while or once 4.0 is polished will you discontinue support for 3.x? If you discontinue support for 3.x, you’ll be leaving your largest user base behind won’t you? Firstly, the product is great as it is now, and is highly appreciated by me and many of my friends. Thanks again for all the hard work. If a ribbon UI is in the future, will it be possible to either turn it iff or shift it to the left or right side? Otherwise it takes up too much space on a laptop screen. I do not think there are any haters in this bolg, or anybody really purposely want to hurt Rick’s feelings. However, there are definetely people who eager to see 4.0 sooner, and try to “help” Rick with clumsy suggestions. That should be frustrating, because I saw Rick’s comments “please do not tell me what to do I have plans and not going to change them” more than once. Oh well, I guess, it if just a part of occupation hazard for famous free software developer. I would just take it easy. Tao Yue, there really aren’t any technical difficulties. The issues to solve relate to having a good UX, and adhering to the Office Ribbon Licensing requirements. deoren, PDN4 will not make XP users unable to run PDN 3.x. Progress must be made. The choice is between PDN4 on Vista/7+ in 2011/2012, or no PDN4 or at least no PDN4 until much, much later. Once PDN4 is released, the PDN3.x codebase will only see updates if a critical security update is needed. I simply do not have the time to support two things. Also, keep in mind that even Microsoft will not be supporting XP in any way past a certain date. The current plan is to keep the latest XP-supported release of PDN available for 1 year after PDN4 is released. In fact, once PDN4 is out I may even put out one final PDN3.x update that refuses to install on Win7/Vista. Sean, a required feature of the ribbon is the ability to minimize it. You can either double click a tab or click on the “v” or “^” button on the right, and it will then free up the space taken up by the ribbon (other than the tabs) for the client area of the app. Then when you click on a tab (e.g. Home, View) it temporarily popup over the app, much like the way traditional menus work. You can see this in Office 2007, 2010, and the Win7 Ribbon-based apps (Paint, Wordpad). Whatever keep you passionate about this software is the best thing for us. This new technologies seems great and give you “Fuel”. I think a ribbon is a good choice. I like the sound of the Ribbon UI if that works out. I’m also glad to hear you are going to implement a docking panels feature for Tools, Colors, History, Layers, etc. I find these “windows” in the way quite often, but I don’t want to close them, per se, either. Some type of panels that easily slide/pop in and out would be nice. I couldn’t tell from the Dock Panel Suite screenshots, but I can’t help but think of something like the Ribbon UI “v” or “^” effect. Obviously, the little panel tabs would need to be labeled and “v” or “^” wouldn’t work. But, if you feel that Tools, Colors, History, and Layers are still the most important and needed, you could have Tools and Colors tabs on the left edge of the PDN window and History and Layers tabs on the right edge of the PDN window. Simply clicking on a tab label (like “Tools”) would slide out the Tools panel. In regards to Deoren’s concerns about XP, if you (Rick) don’t release PDN4 until late 2011 or early 2012, surely XP will no longer constitute 50% of the PDN users. I would like to think that by then it might even be down to 20-30% and Windows 7 will be up to 50% or more. Anyway, I feel you are doing the right thing to move forward, especially if 1) you won’t be releasing PDN4 for 18 months or so, which will give people time to migrate to Vista or especially 7, 2) you are taking advantage of newer technology, 3) if it will make development easier on you, and 4) PDN4 will be out sooner because you aren’t spending even more development time trying to maintain XP support. I’m not sure the ribbon will work out this time. By my estimate I can cut 6 months off the project by skipping it .. for now, of course. Ultimately I need to focus on an amount of work that I can do in about 12 months, plus buffer for sleep and beta testing. Rick, I’m so glad to hear that you are planning to add the ribbon UI. This will be the killer feature of Paint.Net and make it far easier to use than Photoshop /GIMP. Please ignore the haters and go ahead with your plan to implement the ribbon UI. Even if that means we will have to wait for a few more months to receive the next update, it will be worth it. I said I might be adding the ribbon. It’s not a 100% decision at this point. In case you add a ribbon, do you already have an idea of the API you may use? One of the many commercial/open source .NET implementations of the Office UI? Interop with the Win7 API through the API code pack (once it supports the 7 ribbon)? Hand-crafted? I’m not using the Win7 Ribbon because it doesn’t allow custom controls, and I need full styling control. I would probably write it from scratch using Direct2D, that way the entire main window can be D2D / GPU. Although, naturally, things like the ComboBox and TextBox controls would not be rolled from scratch. That’d be suicide. They would instead be WinForms controls placed on top of the D2D surface. 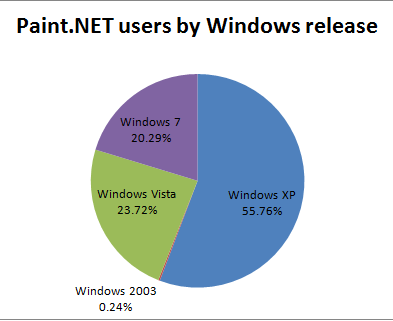 Rick, Will future Paint.NET 4.x drop support for Windows Server 2003 SP2? And if will, just tell why? 2003 goes along with Windows XP, so all the reasons are the same. Server isn’t something I ever test on, and support for it is always “best faith”. There’s no good reason to block it, of course, but sometimes things do work differently (occasional rendering glitches have been spotted). Honestly, Server is for server stuff and it’s not suitable for personal or workstation, despite many people’s fascination with using it as such.